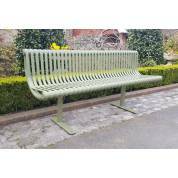 This bench is made for public seating areas of high volume and as such is very well made and made to last. We have taken the park bench outside in order to photograph it effectively, but they are stored in our fully enclosed warehouse environment. Circular seal made in powder coated galvanised metal. Inner ring dimension of 1790mm diameter. Outermost dimension of 2830mm diameter. Powder coated in grey (believe to be RAL colour 7012 - Basalt Grey). As you can see in the images, this is worn away in places, so probably needs a coat of paint to neaten it up. To be fixed into the ground with pole sockets supplied. 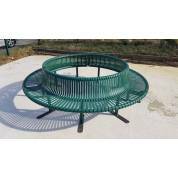 The item will be dismantled into sections for easier collection or delivery. Well-made and sturdy. Heavy-duty public seating. We would prefer this item be collected, but we can organise delivery. Due to the nature of the item, delivery will be price on application, so please message us with your postcode and we will price delivery for you.